"Building Berlin" is an exhibition of recent work by 11 international and German artists living in Berlin, all of whom have also been active organizing, curating, teaching, or otherwise contributing to the development of cultural infrastructure. Thematically, it also focuses on questions of place, migration and economic circumstance. The history of Berlin, Germany, is one of successive reinventions. In parallel to its changing role on the world stage, it has had several incarnations as a pre-eminent destination for artists and thinkers, whether in the cabaret era of the early 20th century, as a counter-cultural refuge while the Wall was up and after it came down, or most recently as the latest destination for the international art jet-set. In the 15 or so years after the Wall came down, an increasing number of art galleries opening up in the Mitte district contributed significantly to the gentrification of that area, and in the past few years that process has spread exponentially through the rest of the city, with dozens of commercial galleries relocating from other cities, young commercial galleries opening, and dozens of artist initiatives launched. Throughout, the residency programs of the Künstlerhaus Bethanien and DAAD have continued to bring international artists into the city, many of whom have stayed on for the affordable living situations available in the economically depressed city. The German capital's financial hardship is one of the factors that now make it a desirable destination for artists; many are there for economic as much as cultural reasons. Historically a trading city without specific industry, Berlin's place in the global imagination has been related to it as a point of political exodus. In that way, it is interesting to reflect that its patterns of migration are inverse to those of New World towns such as the other Berlin — now Kitchener, Ontario — under consideration here. Rural North America of course received many European migrations, and the local cultures reflect these global processes of movement and production, in their traces of various cultures of origin. These might be as specific as the tradition of die-making that exists in the Kitchener-Waterloo area via its German immigrant population, or more general. A region such as southern Ontario has in common with a global city such as Berlin, this condition of having been shaped by patterns of migration, displacement and opportunity-seeking. The expectation is that artists will prove to be the harbingers of gentrification and economic development in Berlin, as has happened in countless neighbourhoods in other cities. Yet the process of turning a wasteland into a vibrant scene is neither a passive nor an automatic one; it unfolds by certain people in those cities gathering together, claiming and rehabilitating space, creating a demand for services and supplies, and building audiences for the things they do — all of which help shape the emergent cultural space. This exhibition focuses on interesting artists living in Berlin, who have also significantly helped build what is now an attractive scene, whether by founding institutions, by teaching, by contributing to the public discourse around art in the city, or by otherwise organizing. They are producers rather than consumers of community, in other words. In keeping with their concern for developing cultural infrastructure, the selected artists' work tends also to be concerned with social themes of city space, migration and trade. The exhibition is accompanied by a downloadable catalogue with essays by the guest curator and Markus Miessen and Magnus Nilsson, Berlin-based architects concerned with cultural infrastructure in Berlin and Europe. Artists: Nevin Aladag, Daniela Brahm, Rui Calçada Bastos, Jesko Fezer and Axel Wieder, Pia Fuchs (German ID of Patricia Reed), Ingo Gerken, Thom Kubli, Lars Ramberg, Karin Sander, Daniel Seiple. 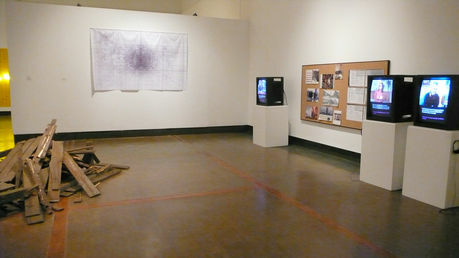 Germaine Koh, view of curatorial project Building Berlin, 2009, exhibition guest-curated for Kitchener-Waterloo Art Gallery. Wall: Pia Fuchs (Patricia Reed). Right: Jesko Fezer and Axel Wieder. Floor: Daniel Seiple.